When the My Little Pony movie trots into theaters in two years, it will go head-to-head with a few Norse gods. Digital Spy reports that the film will share a November 3, 2017 release date with Thor: Ragnarok. You might recall that the third installment in the Thor series was originally scheduled for a July 2017 premiere, but it’s since been pushed back, possibly in an effort to give Mark Ruffalo enough time to work out that “Dr. Banner meets The Hulk” scene he pitched last month. Although the My Little Pony movie will likely draw a slightly different audience than the Marvel film, the movies’ plots have more overlap than you might think. Both films will feature characters who are trying to master their command of stormy weather. 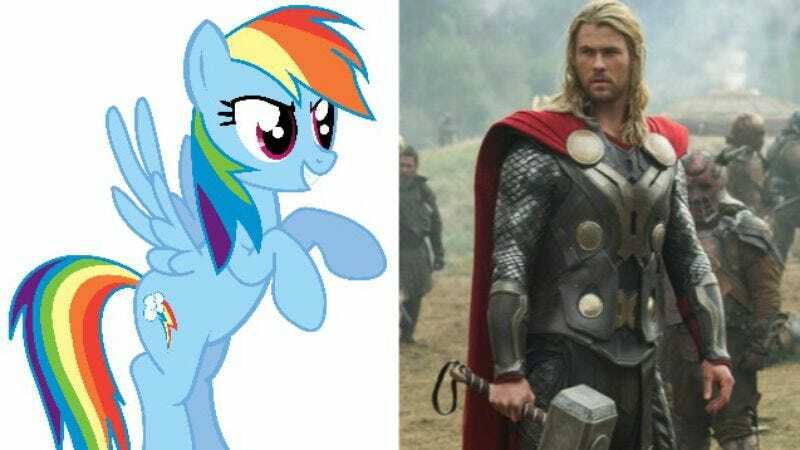 So get ready to watch hoof meet hammer in Rainbow Dash Vs. Thor (which is not at all a real thing).